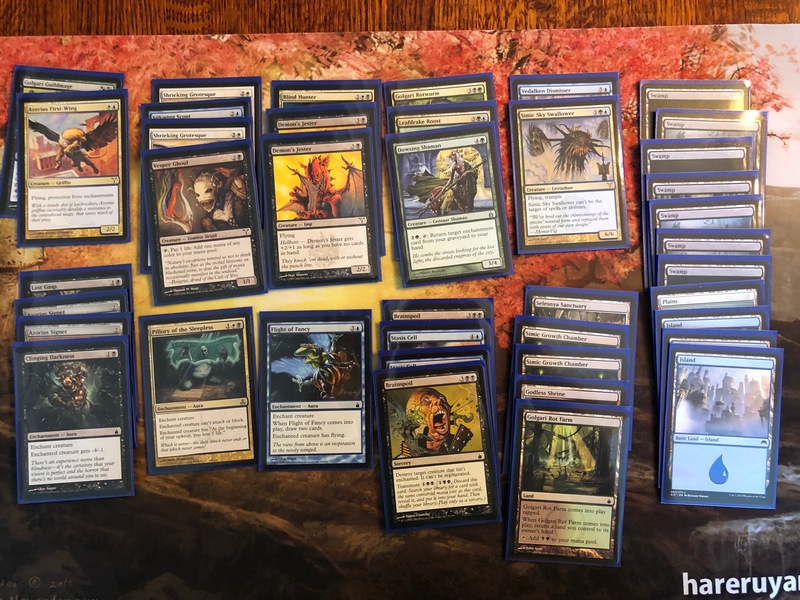 I had another opportunity to do a retro Magic: The Gathering draft with my friend John and a group of 8 other people, including many of the same people as the Fallen Empires Draft. Like that draft, I had a great time and wanted to reflect on my experience. The original Ravnica block draft includes Ravnica: City of Guilds, Guildpact, and Dissension and is abbreviated RGD. Released across 2005 and 2006, these were the first sets to treat all ten color pairs as equal, rather than favoring the five allied color pairs. Older multicolor cards tended to be a variety of one-off designs. Ravnica brought identity to these factions. Notably, RGD has four guilds in the first set and three in each of the next two sets. The cards are heavily themed around two color guilds, with the gold cards typically being the most powerful. However, since each guild only appears in one set, drafting only one guild means you only get a handful of gold cards. Instead, RGD draft heavily encourages playing three or four colors backed with land and artifact fixing. The draft format was a mystery for us going in, and after John announced it he sent us a guide on the basics of this draft format. The central idea is drafting a three color deck where each pack has cards of that color. For example, White Blue Black allows you to take UB Dimir in Rav, BW Orzhov in Guildpact, and WU Azorius in Dissension. We all looked at this list and mostly agreed that it was too much work to memorize it all. We all wanted to crack packs. My first pack had lacked the bomb-level gold cards, but did contain the very solid Last Gasp. The pack also reminded me how weird both Radiance and Transmute were. Radiance is especially awkward in full RGD where your creatures are any of several colors. Transmute requires memorizing the costs of the cards in your deck or else does very little. My next pack also lacked the raw power I was hoping for, but it did have another kind of power: the bounce land Selesnya Sanctuary. Bounce lands are fixing like normal tap lands, but also provide card advantage. An opening hand with two bounce lands and a basic land has five mana in only three cards. My strategy early on was to take bounce lands, removal, and very powerful cards. Of those three, my third pack only had a bounce land, Golgari Rot Farm. Fourth was a Golgari Guildmage. Though not the most powerful of guildmages, I assumed games would be long and grindy, so I liked an easy-to-cast card with late game power. I also saw a Glimpse the Unthinkable go by, which is certainly a powerful card, but I wasn’t sure if I could assemble a mill deck with only one pack of Dimir. My next few packs contained a few Convoke cards, but these were things like Conclave Equenaut, which really needs 2-3 creatures convoking it to be worthwhile. The Dredge cards that flowed were similarly weak cards like Shambling Shell. Shambling Shell and Transluminant existed at the tail end of Damage on the Stack. Around this time, Magic designers started to see damage on the stack as design space to be filled. Imagine Shambling Shell in a world where you can stack lethal damage on an enemy creature damage and then sac it to pump another creature you control. This could save another creature before stacked damage resolves, and then you can dredge Shambling back for more value. Without damage on the stack, it’s a bad regenerating 3/1. So instead of synergy cards, I took a pair of Brainspoils (and laughed at the idea of transmuting it), Golgari Rotwurm, and the combo of Clinging Darkness with Dowsing Shaman. Towards the end of the pack I weighed Dimir Signet against Flight of Fancy. Signets are fine cards if you’re hoping to ramp into expensive threats. I wasn’t sure if I would find those threats, though, and unlike bounce lands they don’t provide two mana for one card. To finish out the pack I took a pair of Stasis Cells, the underestimated Vedalken Dismisser, and some miscellaneous chaff. Going into the second pack, I had three playable creatures and a wealth of removal. Black, Blue, and Green were my main colors. Opening my first Guildpact pack, I once again didn’t see any standout cards. I stuck with my strategy and took an Izzet Boilerworks. The Replicate cards seem hard for me to use with my 3+ color deck, so any Izzet cards I take will be on standalone power level. Second pack I get another curve ball with Pillory of the Sleepless. Removal and win condition in one package, I picked it over the beefy Ghor-Clan Savage. I didn’t feel I would have the board presence to reliably activate Bloodthirst. Next I take Hypervolt Grasp for its combination of small creature kill and win condition, then I take another Izzet Boilerworks. The Haunt cards I see are pretty mild while being very complicated. I take a Shrieking Grotesque and a Blind Hunter as solid fliers. Some Izzet Chronarchs flow by but I’m not sure if I can afford to play all high cost small creatures. I grab a Godless Shrine and another Shrieking Grotesque. People at the table were voicing how overwhelming the choices were in this pack. Normal drafting is about finding an open niche and building it up over several packs. RGD guarantees that doesn’t work, since any color pairs you prioritized in the first pack just don’t exist in the later packs. I finish out the pack with a pair of solid Ogre Savants, a Nodorog as emergency beef, and some junk. Overall, this pack delivered me solid Orzhov removal and fliers and some Izzet creatures and Izzet fixing. My great black removal from pack one should help keep me in the game until I can regain tempo through the Savants and my fliers. Going into the last pack, I’m leaning away from green and maybe away from blue, though I do have some middling blue removal. In my first pack I open another great removal spell in Wrecking Ball and I start to think I might be a RB removal deck splashing white for fliers. My next pack compares the so-so Demon Jester with Assault Zeppelid and Plumes of Peace, which is comparable to my Stasis Cells. I take the Demon Jester. Everyone is once again reeling from the RGD Effect: “These aren’t my colors!” I keep sticking to my strategy and next take a Simic Growth Chamber, even though I figured I was leaning away from green. I receive a Simic Sky Swallower next, which is strong enough to be in Cube drafts! This is the reward for staying open and taking bounce lands. I take it, and then take another Simic Growth Chamber. This does mean I’m leaning away from either red or white again, since I’m now recommitting to blue/green and I can’t abandon my black removal. My fifth pack has a Leafdrake Roost, which seems bomb-level to me. I’m still staggering from the wild color shifts, but with that and my next pick of Silkwing Scout, I feel like I have enough cards to go with my Simic bounce lands. I’m starting to feel that I’m drafting a Sealed pool, and I’ll just build whatever I can from what I have in five colors. Another Demon Jester and a Vesper Ghoul make it into my pile. I cave on my Signet rule and take a pair of Azorius Signets. I then convince myself that Azorius First Wing will be playable, and finish the rest of the draft with marginal cards. Of Hellbent, Forecast, and Graft, the only great card I saw was Cytoplast Manipulator, and that was while I was taking Simic bounce lands. It was surprising to me how irrelevant the cards with guild mechanics on them were in RGD draft. Zack was playing Selesnya with a little red to give haste to his Gruul Scrappers. In the first game, I fired off removal on his first few threats. Then, I stuck a Golgari Rotwurm and sealed up the game after I forced a double block and used Last Gasp for the 2-for-1. Game 2 Zack was stuck on two lands and my growing air force was too hard to recover from. Ryan surprised me by coming out of the gate with Wild Cantors, then prolonged his attack with Nightguard Patrols. The Patrols would be filler in most sets but in a world of 4 mana 2/2s, they seemed reasonable. Ryan is also the world’s biggest Sigarda’s Aid fan and proudly flashed his Grifter’s Blade as a combo with the Patrols. My deck only has five ground creatures, and only two that can block the Patrols. After getting behind, my deck eventually drew into Leafdrake Roost game one and Simic Sky Swallower game two. Both plays were beyond Ryan’s draws ability to overcome and I came out victorious. Shobi was one of the few players with significant RGD drafting experience at the table and had hinted that he had drafted an unusual deck. He cast a Court Hussar with no white and a Lurking Informant, so I assumed he was some sort of control deck. He also played a Stinkweed Imp, which was an excellent value card against all of my little fliers. I eventually got out Leafdrake Roost which generated enough quantity to overwhelm the Imp. Next game I’m held back by Wee Dragonauts, another solid card against the fliers I play out. Later he plays Izzet Guildmage, which seems like a cool value card later, and maybe enough to multiply some key spell. Then I remember… Glimpse the Unthinkable. A copied Glimpse at this point would drop me to a handful of cards in my library! The next turn I choose between playing either Simic Sky Swallower or Golgari Guildmage+Brainspoil. Given that I could lose 20 cards at any moment, I decide on SSS. He counters it with Trial//Error. I’m able to bring it back with the Guildmage later, but by then he has Glimpsed me, and when he returns the Glimpse with Izzet Chronarch, I concede. In the last game, I kill a Minister of Impediments while deploying the air force. His Stinkweed Imp again holds back my team. I again have SSS ready, and I wait for him to not have UB up. Once I do, I run the SSS out, but it gets stopped by a Convolute. He Glimpses me out with ample Chronarchs. In retrospect, I think I needed to aggressively trade my fliers off for his Imp. Five cards is not a small amount of cards to dredge, and I needed to give myself the chance of hitting his key Izzet Guildmages and Izzet Chronarchs. Game one, I keep Godless Shrine and Swamp but fail to draw my other colors. I see he’s playing a Selesnya-ish deck. My next two games play out the way my previous games did: tempo fliers and removal. I mostly saw the ramp part of his deck and not many payoffs. I did get to cast Vedalken Dismisser this match. On battlefields where my opponents have only stuck one relevant creature, Dismisser resets their turn, allows for me to hit with fliers again, and while leaving behind a 2/2 body. In a format with so few big creatures, that 2/2 seemed alright. We battle Shrieking Grotesques for a while until he sticks a flier with a Necromancer’s Magemark, which is nice against my removal. He then plays a Sky Hussar with a Writ of Passage, giving it extra life thanks to the Magemark. I draw my Leafdrake Roost, though, and manage to gum up the skies until I have enough drakes to win outright. Second game plays out similarly, but without the Magemark, so I’m able to remove his good creatures and win. As usual for these parties, we all bring prizes and distribute them based on records. We had a three way tie between myself, Shobi’s mill deck, and Ryan’s creature combat deck. To fit the mystery theme, we play Memory for cards, take prize boxes based on cryptic drawings, and decipher letter and number clues. I greatly enjoyed the chaotic and complex draft process for RGD. I can’t remember a set where it was more difficult to weigh which colors and factions to pursue. At the same time, there were some low points. Many of the guild mechanics were irrelevant or on bad cards. As interesting as the drafting was, my games played out just like any other WB fliers deck, except with a greater chance of color screw. People were stuck playing cards like Simic Ragworm, Gruul Scrapper, and Mourning Thrull. Nonetheless, it was especially exciting to actually look at and play with all of these old cards. Although Ravnica was released more than a decade after Magic started, it’s still more than a decade old. New sets like Guilds of Ravnica are so much more fair and flat in their power level. Older sets like RGD have huge differences in power. Evaluating so many old cards on the fly is both challenging and exhilarating. Thanks again to John and everyone else for making it such a great day!